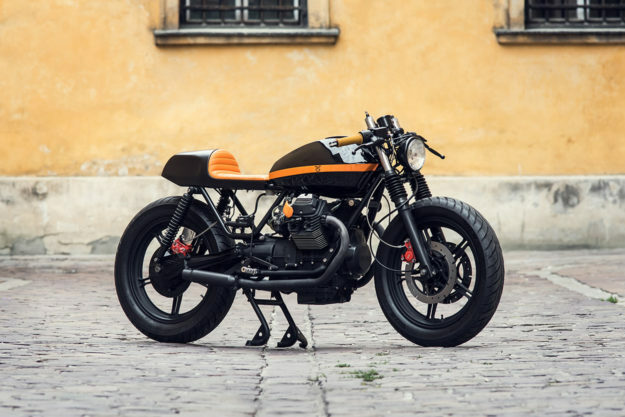 No corner of the world is immune from the alt-moto custom scene: This remarkably stylish Moto Guzzi V65 comes from the ancient city of Kraków in Poland. 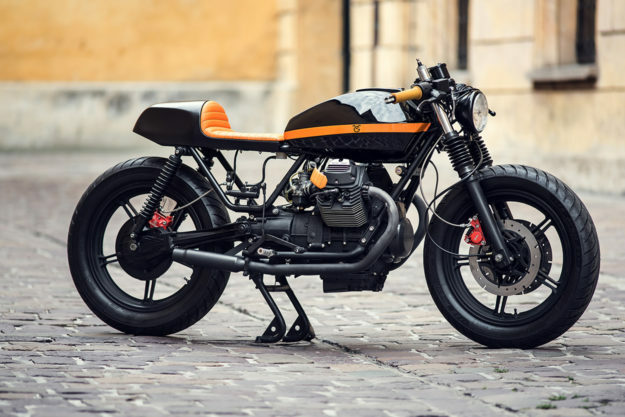 And it holds its own against most of the Guzzi builds we see from western Europe. It’s the work of a small shop we haven’t come across before, Ventus Garage. 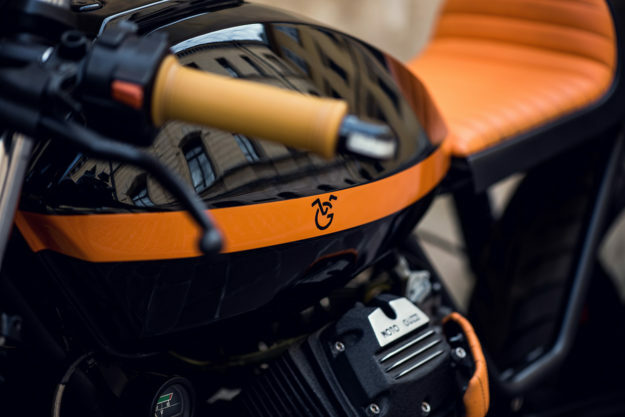 The fit and finish are almost at factory levels, and there are hints of KTM in the striking black-and-orange color scheme. We don’t see many V65s, but hopefully that’s about to change. Launched in 1982, it’s essentially a bored-and-stroked V50, and not short of oomph. Contemporary road testers managed to reach almost 120 mph (190 kph), which makes it slightly faster than Mandello’s current V7 and V9 offerings. That point was not lost on Ventus’ Paweł Guzik and Tomek Janicki. 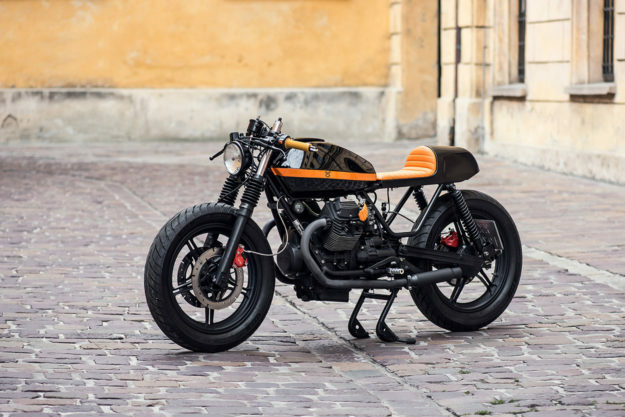 Their V65 is a 1994 model, from the final year of production, and after a few test rides they decided to rebuild it in the modern cafe racer style. “Bikes are supposed to be glued down to the road, so we decided to lower the suspension,” says Pawel. 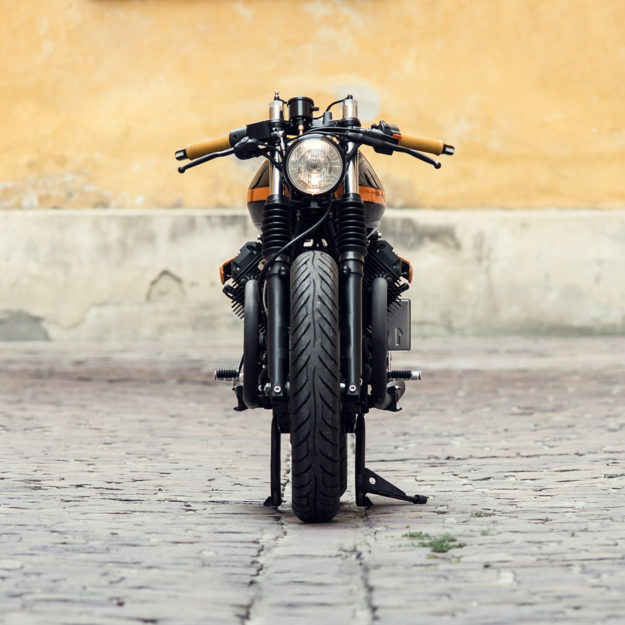 The stance is perfect: The forks have been rebuilt with springs shortened by ten centimeters (four inches), and the new rear shocks are six centimeters (2.5 inches) shorter at the back. New stainless steel braided lines sharpen up the braking, and the Brembo calipers have been refinished in red to add a little character. Bigger changes were applied to the frame, which is modified to fit the classic cafe racer-style tail unit. (The electrics and battery are now hidden inside.) The seat is immaculately crafted and finished in a waterproof synthetic material. 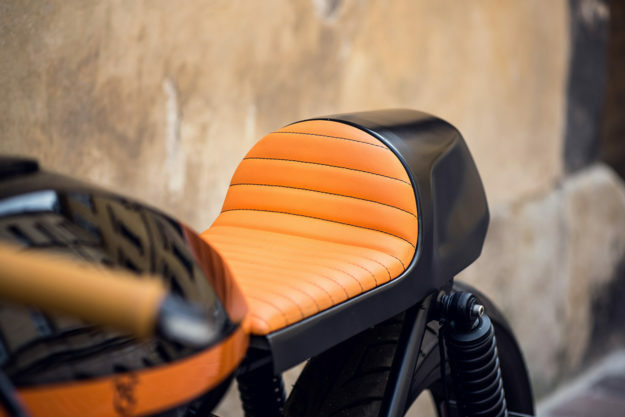 You don’t often see brilliant orange upholstery, and for good reason, but in this instance it works. The engine was in good condition, so after a light refresh it was painted with a black VHT engine enamel. The Dell’Orto PHBH 30 carbs were given a through clean, and fitted with larger jets and pod filters. 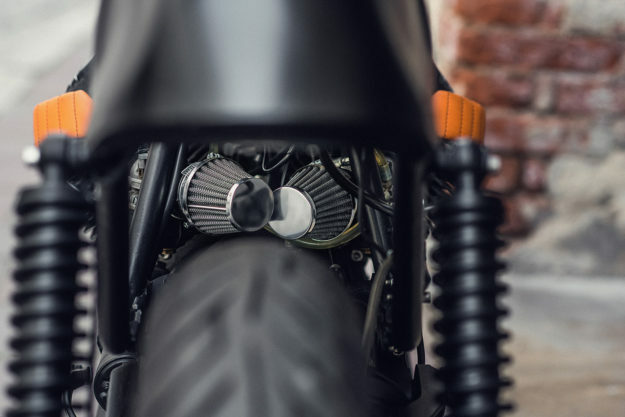 The clip-on bars are Ventus’ own design, set up for a comfortable riding position and finished off with Biltwell’s ‘Kung Fu’ grips. Right ahead is a classic black Bates 5¾-inch headlight. This is one of those rare occasions where a new tank isn’t needed to change the look of the bike. The stock V65 unit has good lines, and now looks stunning in glossy black paint and an orange stripe. 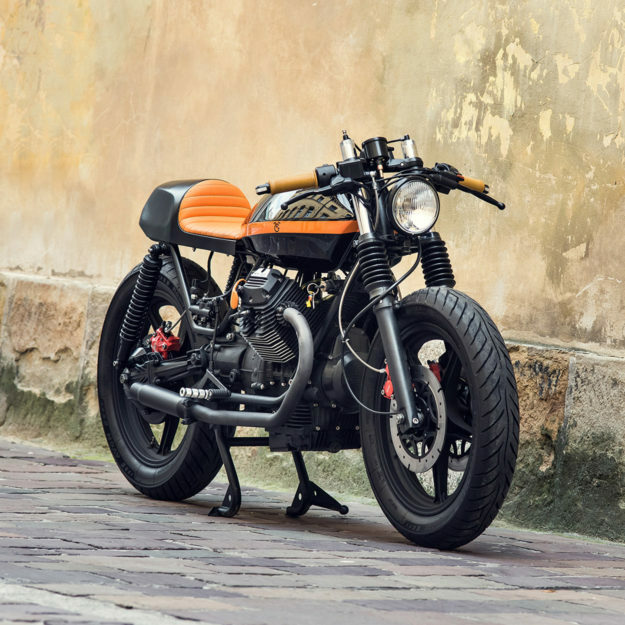 With the price of most custom donor bikes steadily rising, it’s reassuring to know that V65 values are still reasonable. You can pick one up in the US for around $2,000, or a little more if it’s in exceptional condition. 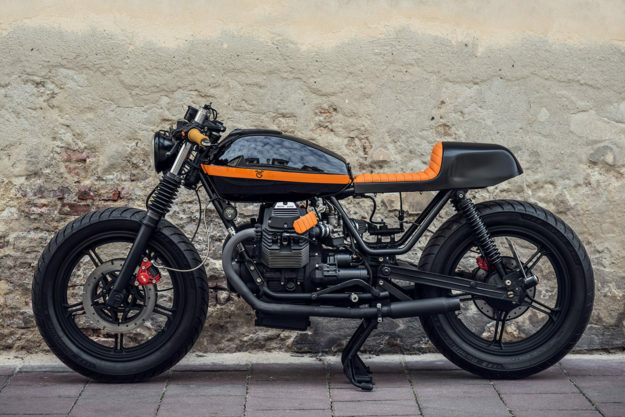 Add two or three large ones for the kind of custom work you see here, and you have a very sharp retro custom—for less than the price of a moderately optioned ten-year-old Harley Sportster. That sounds like a smart move to us. 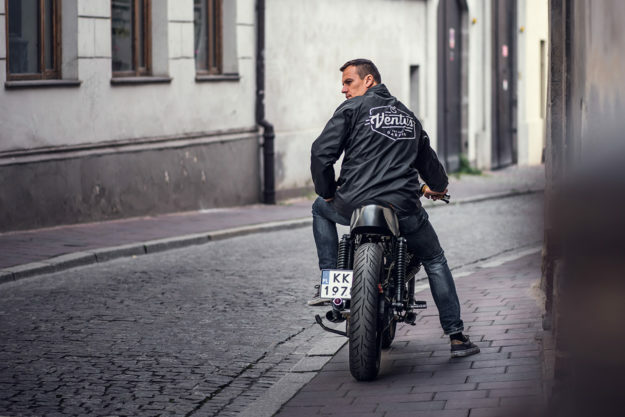 And if you’re not within riding distance of central Europe, there’s a second option to get the sharp Ventus style: Pawel’s brother Maciek has started up an Australian offshoot in Perth.